Blog for the lovers of the animals. The Cougar (Puma concolor), also known as puma, mountain lion, catamount, or panther, depending on the region, is a mammal of the Felidae family, native to the Americas. This large, solitary cat has the greatest range of any large wild terrestrial mammal in the Western Hemisphere, extending from Yukon in Canada to the southern Andes of South America. Cougars are slender and agile cats. Adults stand about 60 to 76 cm (2.0 to 2.5 ft) tall at the shoulders. The length of adult males is around 2.4 m (8 ft) long nose to tail, with overall ranges between 1.5 and 2.75 meters (5 and 9 ft) nose to tail suggested for the species in general. Males typically weigh between 53 to 90 kilograms (115 to 198 pounds), averaging 62 kg (137 lb). In rare cases, some may reach over 120 kg (264 lb). Females typically weigh between 29 and 64 kg (64 and 141 lb), averaging 42 kg (93 lb). Cougar size is smallest close to the equator, and larger towards the poles. The head of the cat is round and the ears erect. Its powerful forequarters, neck, and jaw serve to grasp and hold large prey. It has five retractable claws on its forepaws (one a dewclaw) and four on its hind paws. The larger front feet and claws are adaptations to clutching prey. Cougars can be almost as large as jaguars. 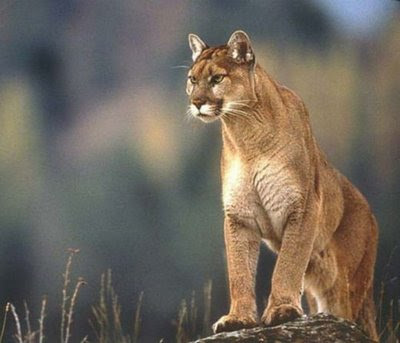 The grace and power of the cougar have been widely admired in the cultures of the indigenous peoples of the Americas. The Inca city of Cusco is reported to have been designed in the shape of a cougar, and the animal also gave their name to both Inca regions and people. The Moche people represented the puma often in their ceramics The sky and thunder god of the Inca, Viracocha, has been associated with the animal. Growing up to 2 meters (6 feet 7 inches) in diameter and weighing up to 220 kilograms (ca. 450 pounds),  Nomura's Jellyfish reside primarily in the waters between China and Japan, primarily centralized in the Yellow Sea and East China Sea . Nomura's Jellyfish (, echizen kurage, Nemopilema nomurai) is a very large Japanese jellyfish. It is in the same size class as the lion's mane jellyfish, the largest cnidarian in the world. The width of these jellyfish are slightly larger than the height of most full grown men. In some places, jellyfish density is reported to be "one hundred times higher" than normal, seemingly without explanation.There was a previous spike in the population recorded in 1958 and in 1995. Cysticerci have three morphologically distinct types. The common one is the ordinary "cellulose" cysticercus which has a fluid filled bladder that is 0.5 cm to 1.5 cm in length and an invaginated scolex. The intermediate form has a scolex while the "racemose" has no evident scolex but are believed to be larger and much more dangerous. They are 20 cm in length and have 60 ml of fluid and 13% of patients might have all three types in the brain. Though humans usually serve as a definitive host, eating infected meat, fostering adult tapeworms in the intestine, and passing eggs through feces, sometimes a cysticercus (a larva sometimes called a "bladder worm") develops in the human and the human acts like an intermediate host. This happens if eggs get to the stomach, usually as a result of contaminated hands, but also of vomiting. Cysticerci often occur in the central nervous system, which can cause major neurological problems like epilepsy and even death. The condition of having cysticerci in one's body is called Cysticercosis, and is discussed in its own article. Eggs can be diagnosed only to the family (biology) level, but if a proglottid's uterus is stained with India ink, the number of visible uterine branches can help identify the species: unlike the Taenia saginata uteri, T. solium uteri have only five to ten uterine branches on each side. Infection with T. solium adults is treated with niclosamide, which is one of the most popular drugs for adult tapeworm infections, as well as for fluke infections. As cysticercosis is a major risk, it is important to wash one's hands before eating and to suppress vomiting if a patient may be infected with T. solium. If neurocysticercosis occurs the drug of choice is Praziquantel. This drug damages the parasites skin internally causing it to disintegrate and is then removed by the host's immune system. Infection may be prevented with proper disposal of human feces around pigs, cooking meat thoroughly, and/or freezing the meat at -10oC for 5 days. Most cases occur because infected food handlers contaminate the food. The cassowary, a fierce bird. "The inner or second of the three toes is fitted with a long, straight, murderous nail which can sever an arm or eviscerate an abdomen with ease. There are many records of natives being killed by this bird." The cassowary (genus Casuarius) is a very large flightless bird native to the tropical forests of New Guinea and nearby islands, and northeastern Australia. The Southern Cassowary is the third tallest and second heaviest living bird, smaller only than the Ostrich and Emu. Cassowaries feed mainly on fruits, though all species are truly omnivorous and will take a range of other plant food including shoots, grass seeds and fungi in addition to invertebrates and small vertebrates. Cassowaries are very shy, but when disturbed, they are capable of inflicting fatal injuries to dogs and children. The Northern and Dwarf Cassowaries are not well known. All cassowaries are usually shy birds of the deep forest, adept at disappearing long before a human knows they are there. Even the more accessible Southern Cassowary of the far north Queensland rain forests is not well understood. Females are bigger and more brightly coloured. Adult Southern Cassowaries are 1.5 to 1.8 metres (59–71 in) tall, although some females may reach 2 metres (79 in), and weigh 58.5 kilograms (129 lb). All cassowaries have feathers that consist of a shaft and loose barbules. They do not have retrices (tail feathers) or a preen gland. Cassowaries have small wings with 5-6 large remeges. These are reduced to stiff, keratinous quills, like porcupine quills, with no barbs. A claw is on each second finger. The furcula and coracoid are degenerate, and their palatal bones and sphenoid bones touch each other. A cassowary's three-toed feet have sharp claws. The second toe, the inner one in the medial position, sports a dagger-like claw that is 125 millimetres (4.9 in) long. This claw is particularly fearsome since cassowaries sometimes kick humans and animals with their enormously powerful legs (see Cassowary Attacks, below). 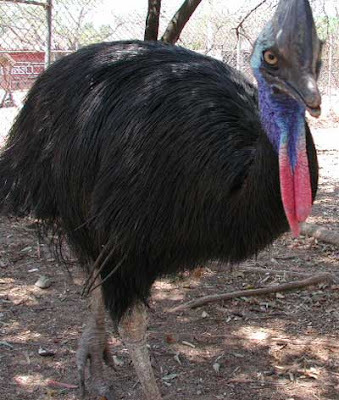 Cassowaries can run up to 50 km/h (31 mph) through the dense forest. They can jump up to 1.5 metres (4.9 ft)and they are good swimmers, crossing wide rivers and swimming in the sea as well. Two years ago, a group of Ugandan chimps provided a blow to the idea that humans are the only animals that truly behave selflessly to one another. These chimps showed clear signs of true selflessness, helping both human handlers and other unrelated chimps with no desire for reward. The chimps could be helping their relatives in order to advanced the spread of its own genes, which family members are likely to share. Or they could be doing a favour for another individual, in the knowledge that it will be repaid later on. Either way, it's the do-gooder that eventually benefits. Humans, on the other hand, seem to flaunt this rule. We often help others who are not relatives and who are unlikely to repay the favour. We go out of our way to be helpful, and sometimes even risk personal harm to do so. En 2007, Felix Warneken y colegas se forman el Instituto de Max Planck para la Antropología Evolutiva ha encontrado obligando pruebas que no somos solos. Contrariamente a estudios anteriores, ellos han encontrado que chimps también se comporta altruistically de un modo muy humano. Ellos echan una mano sin relaciones a forasteros sin la expectativa de recompensa, y aún van a grandes longitudes a hacer así. In the first test, the chimps saw a human unsuccessfully trying to reach a stick that they themselves could reach. Warneken found that chimps were all too happy to pass the stick across, regardless of whether they were rewarded with a banana or not. In fact, the only thing that affected their readiness to lend a hand was whether the human was struggling for the stick or just passively staring at it. Él encontró la misma cosa cuando él controló una estructuración similar con los 36 niños humanos de dieciocho meses, pero con cubos de juguete en lugar de palos. 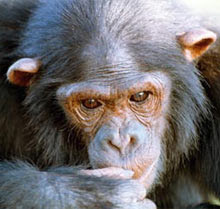 En aquella edad, las capacidades mentales de un bebé son pensadas a similar a aquellos de chimps, y de verdad la única verdadera diferencia entre los dos era que los bebés eran más rápidos con su ayuda. Passing a stick across is obviously fairly easy but would altruism persist if there was effort involved? Warneken tested this by changing the experiment so that the chimps had to climb over a raceway and the toddlers had to walk past a series of obstacles. Those that helped in the first test were happy to do so in the second, again without any rewards. A skeptic might argue that this doesn't show anything. During their stay at the sanctuary, the chimps could have learned that helping any one of their strange two-legged keepers was worth it. The acid test then, was to see if the chimps would help each other. The first chimp - the subject - could only get into a room with food by lifting the chain attached to its door. But it couldn't reach the chain - only a second chimp, the observer, could do that. And once again, the chimps proved their selflessness, lifting the chain for their fellow chimps the vast majority of the time. what animal are looking for? Giant wild pig or boar. A frog with hair and teeth. Mantis religiosa or European Mantis. monkey with an upturned face. The 10 most painful stings on the planet. The beauty of the Marabou. The Cuban solenodon or almiqui of Cuba. The fake giant crocodile in Australia. The largest turtle on Earth. The most beautiful bird in the world: The Mandarin Duck. The phantom of the ocean. The regeneration of the salamander. What are the worst insect bites? Zombie ants and the fungus housed inside.